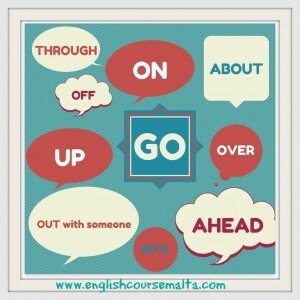 Try to use Phrasal Verbs such as GO as much as possible. Native English speakers typically use plenty of Phrasal Verbs. This is especially true in speaking and conversation. This is just a short list of Phrasal Verbs with GO – there are many more. to go on (1) – to continue. He never seems to get to the end of the story. It just keeps going on and on. to go on (2) – to happen. I thought something was going on in the town when I heard the fireworks. to go up / down – to increase / decrease. The price of living always seems to go up. It never goes down. to go out with someone – to date. They went out with each other for 2 years before they got engaged. to go into – to discuss. She doesn’t like to go into details about her divorce. to go off (1) – to stop liking. I used to love McDonald’s. Then I ate it every day for 2 weeks and I completely went off it. to go off (2) – use for food to say that it is no longer good to eat. You have to be careful with chicken and milk. If you don’t put them in the fridge, they will go off. to go by – to pass. Most people just go by tramps and beggars on the street without even noticing them. to go back – to return. It’s started raining. We’d better go back home before we get wet. to go ahead – to move forward. Despite opposition from the people, the government decided to go ahead with plans to build a new airport. to go over – to focus on. Let’s go over the details of the contract after lunch. Teacher’s Tip! Take the test below to test your Phrasal Verbs with Go. Make a list of all the ones that you get wrong and jot them down in your notebook. If you prefer to learn online, use a free online service to create your list. 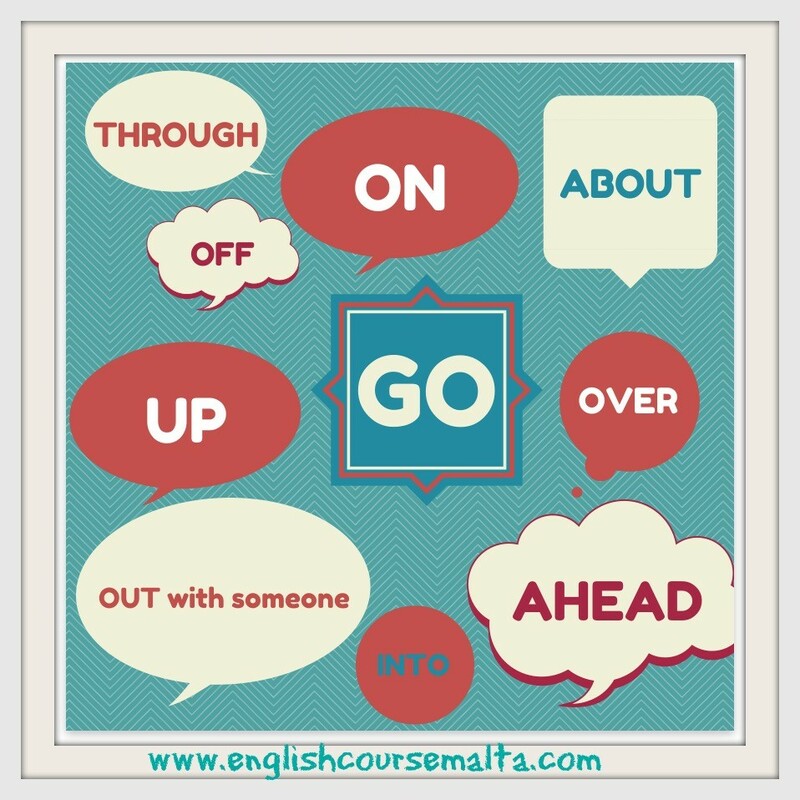 Do you think you know how to use GO as a phrasal verb? Take this free online exercise and check your skills on this quiz! It’s started raining. We’d better go ____ home before we get wet. Can you find the correct preposition to make a phrasal verb that means ‘to return’? I told the salesman that I wasn’t interested but he just kept going ______ about the product. Choose the correct preposition below to create a phrasal verb that means “to continue talking”. The price of fuel just keeps going ________. It’s become so expensive, people have started using public transport instead. Can you find the correct preposition to make a phrasal verb that means ‘to rise’ or ‘to increase’? They kept their relationship a secret because they didn’t want anyone to know that they had started going _________ with each other. Can you find the correct preposition to make a phrasal verb that means ‘to date’? When I was pregnant, I went _______ milk. I just couldn’t drink it all. Can you find the correct preposition to make a phrasal verb that means ‘to stop liking’? I will give you an introduction to the overall plan to start with and go ________ the details at a later stage. This document has many errors. Let’s go ______ it together to find them. I couldn’t believe my luck! When I went to buy the dress, the price had gone __________. Can you find the correct word below to make a phrasal verb that means ‘to decrease’ or ‘to lessen’? The shop isn’t doing well. People just go ____ without even looking through the window. Can you find the correct preposition to make a phrasal verb that means ‘to pass’? What’s going _____? Why are you children making so much noise? Can you find the correct preposition to make a phrasal verb that means ‘to happen’? When I finish my studies in Europe, I will go _____ to Senegal. I would like to find work somewhere near my family home. My mother always calls to find out what’s going ______ in my life. She’s very curious. More Multi-Word Verbs: TAKE, COME, MEET, GET, PHRASAL VERBS WITH BACK.